On Tuesday, Apple released iTunes 10.2.1, hot on the heels of 10.2, which the company released on March 2. Unfortunately, Apple’s release notes for 10.2.1 are the same as they were for 10.2, and give no indication of what’s changed. 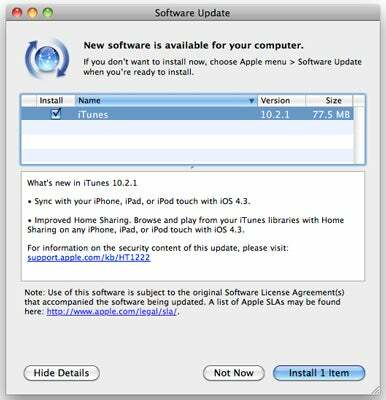 iTunes 10.2 added sync support for devices running iOS 4.3 and brought Home Sharing to iPhones, iPads, and iPod touches running iOS 4.3. iOS 4.3 is supposed to be released on Friday alongside the iPad 2.
iTunes 10.2.1 is available on Apple's Website or through Software Update. Apple’s security content page wasn’t updated at the time this story was posted to reflect the updated version.